The neighborhood of Germantown is the only finalist in the state of Pennsylvania. Philadelphia’s neighborhoods each have character and history that deserve to be preserved, and it often falls to small business owners to maintain the buildings that serve as monuments to the past. The National Trust for Historic Preservation has launched a nationwide competition to distribute $2 million in grants for just that purpose, and the neighborhood of Germantown is the only finalist in the state of Pennsylvania. It is up to citizens to vote each day and choose which of the 25 finalists will win up to $150,000 toward historic preservation. If Germantown secures enough votes, this grant will be used to help preserve two historic buildings on Germantown Avenue’s business corridor: Parker Hall (5801 Germantown Ave.) and John Trower’s building (5706 Germantown Ave.). These two significant 20th-century African-American historic sites are in desperate need of facade and structural improvements. The history of both buildings dates to the 1870s. Today, Parker Hall contains the office of Dr. Althea Hankins and the ACES Museum, which pays tribute to multi-ethnic contributions to the U.S. military in World War II through artifacts and photographs of African-American, Japanese and Jewish men and women. This three-story Georgian Revival-style building has been used as a social hall since the 1870s. Parker Hall became racially integrated in the 1920s and was an important pillar of the black community. The third-floor ballroom was used as a USO-like space for black soldiers in World War II, but exterior wall issues forced the museum to relocate to the first floor, and the second and third floors were closed. Once repaired, the museum will return to the second floor, and the third floor will once again be used for events. Past meets present today at Parker Hall as the ACES Museum hosts veterans’ groups from throughout the country. Without this grant, this site dedicated to often overlooked and under-appreciated American heroes may have to close. John Trower’s building today is home to the Crab House restaurant, a popular local business, but it was built as a bank in 1870. In 1887, John Trower bought the building. Trower was a prominent African-American who was a caterer, real estate investor and restaurateur. As he rose to be one of the wealthiest African-Americans in the United States, he became a major philanthropist, funding black churches, a trade school and an early association enabling blacks to buy homes. Mr. Sunny Kim is the current owner of the building. He knows the importance of the history and has tried to maintain the building with preservation in mind — a monumental task for a small business owner to take on. The grant will fund repairs to the mansard roof and stone façade and will also fund external signage to recognize the historic importance of this building, which is recognized by the Pennsylvania Historical and Museum Commission honoring John Trower. Germantown United CDC’s mission is to promote and facilitate the revitalization of Germantown and its business corridors through a sustainable, creative and community-driven approach to economic development. GUCDC believes that Germantown’s history and built environment are economic assets upon which to rebuild Germantown’s economy and create equitable economic development. After decades of decline, there are signs of improvement and vibrancy in Germantown, and the rejuvenation of these two buildings, located near a recently completed city of Philadelphia makeover of the historic Vernon Park and a pending adaptive reuse project of the YWCA building, will help turn the tide on this block. The Partners in Preservation: Main Streets competition runs until Oct. 31. 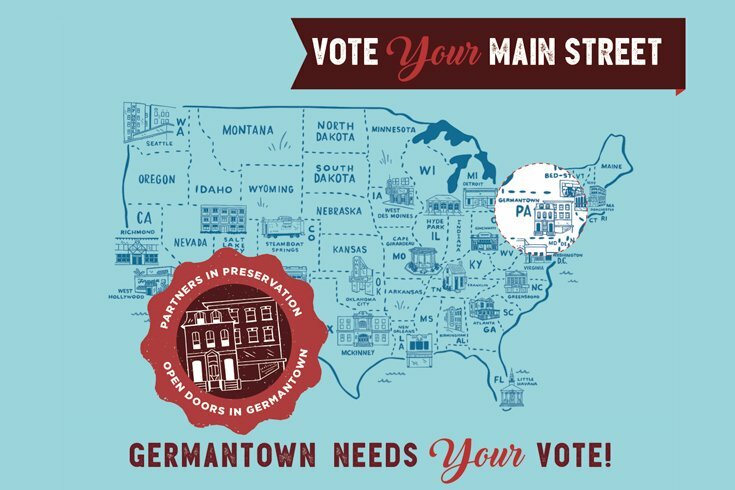 Germantown needs to secure as many votes as possible at VoteYourMainStreet.org/Germantown, and your help is crucial to make sure Pennsylvania wins this grant. Voters also can enter for a chance to win a trip from National Geographic, so vote up to five times each day and spread the word to preserve these historic buildings, help these small businesses and honor the contributions of African-Americans to the history and culture of this country.